Get your Bonus Bucks! – Starts Today through Sept. 29! Bonus Bucks! 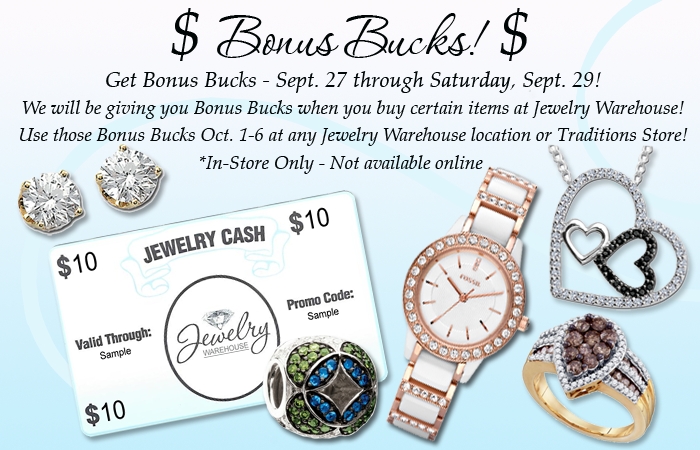 Starting – Thursday, Sept. 27 through Saturday, Sept. 29, we are giving you Bonus Bucks when you buy certain items at Jewelry Warehouse! What are Bonus Bucks? – When you purchase the items that we have listed below at Jewelry Warehouse, we will give you a Bonus Bucks coupon to come back and spend that amount earned, at any Jewelry Warehouse location or any of our Traditions stores! When can you spend Bonus Bucks? – You can spend those Bonus Bucks the following week, Oct. 1-6. How much money can you get in Bonus Bucks? – You can get from $5 to $100 in Bonus Bucks! This entry was posted in Jewelry, Jewelry News, Jewelry Trends, Sales and tagged bonus bucks, chamilia, citizen, fossil, free money for jewelry, jewelry warehouse, kameleon, pulsar. Bookmark the permalink.